Ashlyn Sabatine, right, gets a pedicure from Mariko Ogawa, cosmetologist at Hilton Hawaiian Village's Yspa. Trisha Barbosa, center, also was there for a treatment. Kaitlin Tinker, 11, spent a lot of her Hawaii vacation time on the beach, but she chose to spend her last day on Oahu getting her hair braided into island-style cornrows at Hilton Hawaiian Village's newly opened Yspa, which caters to teens and tweens. When it comes to travel, it's a small world after all. » One in four household trips in the U.S. (26 percent) include children under 18, or 170.1 million trips in total in 2003. » Most (91 percent) trips with children are for leisure, nearly half of which are taken to visit friends or relatives. » Four in 10 overnight trips with children include a stay in a hotel, motel or bed-and-breakfast establishment. » Popular activities on trips with children include shopping (32 percent), attending a social/family event (31 percent), engaging in an outdoor activity (14 percent), going to the beach (12 percent), and going to a theme/ amusement park (12 percent). » More than half of trips with children are taken by households headed by Baby Boomers, between the ages of 35 and 54. Source: The Travel Industry Association's Domestic Travel Market Report, 2004 Edition. Tinker, who hails from Santa Cruz, Calif. where she is no stranger to the pedicure and pampering scene, is just one of an estimated 60 million in her generation, which by sheer numbers alone has the power to give their baby boomer and Generation X parents a run for their money. "It's fun to get away from the boys," said Tinker, who was accompanied on her first trip to Hawaii by her mother Heidi Olson-Tinker, her father Scott Tinker and her younger brothers Ryen and Hayden. Like many other of Hawaii's vacationing families, the Tinkers chose Hilton Hawaiian Village, in part, because of the amenity package that it offered for their keiki. While Olson-Tinker said trips to the spa weren't part of her own childhood, she wants her daughter to learn the importance of taking time for herself. The opportunity to experience spa time together at Hilton was a huge draw for both mother and daughter. "Spa time teaches her to take care of herself. I model that for her," said Olson-Tinker, a psychologist and entrepreneur. "These days, it's not acceptable for moms to be martyrs." Judging from the strong demand for Generation Y travel programs, it's not in vogue for kids to be self-sacrificing anymore, either. Many a Generation Xer remembers spending family vacation time sitting in the back seat of the car or plane squished up between siblings like a discarded peanut butter sandwich only to arrive at a cheap budget motel where they had to draw straws to find out if they were bunking on the couch or the floor. But today, young travelers are enjoying an entirely different experience. They have their own kid-themed suites stocked with DVDS, CDs, gaming systems, specialty spa and dining menus and kid-centered entertainment and clubs. 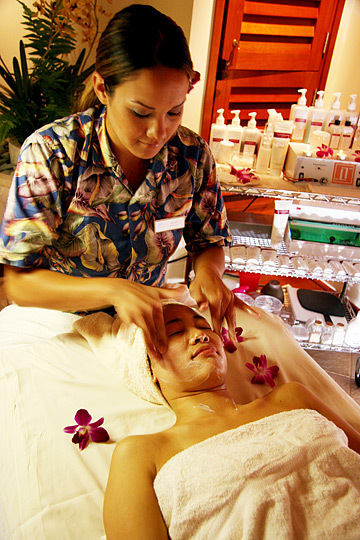 Jennifer Lieu, gets a fruit facial for teenagers from Christie Parongao, an esthetician at Hilton Hawaiian Village's Yspa. Treatments at the kids' division of Hilton's Mandara spa include a Heavenly Massage to massage away school blues; Surfers' Scrub, an exfoliating treatment after a day of activities; and Fabulous Fruity Facial and Acne Attack Facial, said Lora Gallagher, regional director of marketing, Hilton Hawaii. "The interest in kids and teen spa programs has really grown in recent years," said Gallagher, who is a mom herself. "Not only do mom and dad need a relaxing rejuvenation while they are in Hawaii, but the kids want to be a part of that experience as well." Kids like Tinker are the reason Hawaii's visitor industry, which has always had a strong multigenerational market, is beginning to take family recruiting to a higher level. Renewed investment by Hawaii in this market has translated into an increased number of hotel to condominium or suite conversions, a growing number of vacation club and time-share operations and a preponderance of amenities for the pint-sized crowd. The June launch of Hilton's Yspa and the expected December opening of Embassy Suites, which is geared to the family market, as one of the flagship properties in Outrigger's Waikiki Beach Walk project on Lewers Street, are among the most recent examples of Hawaii hotel brands catering to this market. "We definitely see the importance of the multigenerational travel -- it's booming from both the U.S. and Japan," said Barry Wallace, executive vice president of Outrigger Enterprises Group. "We got involved with the Embassy Suites product because of our recognition that family travel is growing in Hawaii. This hotel is possibly the first ever built in Hawaii just for vacationing families." 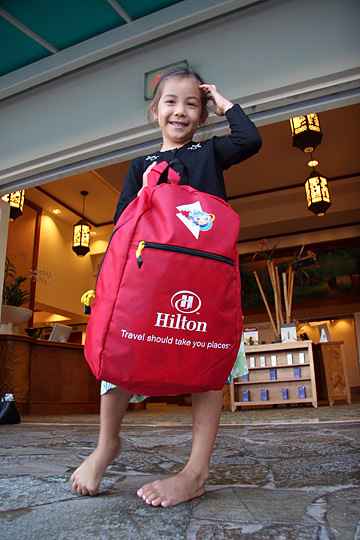 Ashlyn Sabatine shows off a promotional backpack from Hilton Hawaiian Village's Yspa. More than one-third of U.S. travelers vacationed with their kids last year. That's a 44 percent jump from the mid 1990s, making family travel the fastest-growing category for leisure travel, according to a recently released travel monitor from YPB & R.
"The family market has experienced an incredibly significant rise," Yesawich said. "The 1990s were focused on making money, but now it's all about family. We saw a significant spike in family travel in the aftermath of 9/11. It was a direct reflection of the emotional fabric of the country." As technology stretches the workday into nights and weekends, family travel has become increasingly important to vacationers, Yesawich said. "We're even seeing an increase in family travel at non-traditional times," he said. Where family travel used to be centered around holidays and summer break, that trend is changing as evidenced by the 61 percent of adult travelers polled who said they wouldn't hesitate to pull their children out of school for a vacation, Yesawich said. Some school jurisdictions have gone to year-round schedules as well, providing an opportunity for more frequent vacations. And more business travels are electing to take their families with them, said Ken Phillips, staff vice president for Pleasant Holidays LLC, Hawaii's largest wholesaler. "Americans are the worst in the world to take vacations," Phillips said. "They spend more time at work than anyone else so they've become more inclined to take family vacations." These trends have caught the attention of visitor industry players in Hawaii and elsewhere and led to a host of new travel marketing. Generation Y travel marketing began a few years back as destinations realized the appeal of value-based offers such as kids can eat, stay and play free. As the kids, tweens and teen travel market has grown, so has the level of marketing sophistication. Yesterday's value-only offers have morphed into more creative gimmicks such as kids-only clubs, extreme sports lessons, art and cultural activities and yes, even spas for those who don't yet draw paychecks. There's no doubt the visitor industry is paying more attention to families these days than it has in the past, said Janet Catina, a parent of two from Stroudsburg, Penn., who was vacationing on Oahu last week. "In the past when we traveled with our family, I always had the feeling that we were disturbing other people," Catina said, "Now, it's much easier to find family friendly destinations." The Catina family, which has made it a point to vacation together often, said Hawaii has other destinations such as Florida, Boston, California, New Jersey and Virginia beat in terms of its family-friendly atmosphere. "Hawaii is definitely our top choice. There's nowhere else that we want to go," Catina said. Many destinations have gone after the family market, but among kid-friendly destinations, Hawaii still stands out, said Erik Budde, owner of www.travelwithyourkids.com , a Web site that offers family-friendly vacation tips and feedback on popular destinations, including Hawaii. Kaitlin Tinker, gets cornrows from Danielle Cascio, a hair stylist from Hilton Hawaiian Village's Yspa. "I've been to Hawaii four times with kids, and for me it's still the perfect destination," Budde said. "Hawaii pairs the beach with other activities. One of the things that I love about Hawaii is that you can dial it up or back, based on which island that you visit." "The family market is really an extension of our customer base," Barnes said. "Families are into value, but they are also one of our higher-spending markets in terms of activities." Anticipation of a growing family market served as the catalyst to create a Teens and Tweens program at the Ihilani two years ago, Barnes said. "A consultant recommended the program based on market trends," Barnes said. "Frankly, we were a little ahead of the curve. The program started out slow, but now it's caught on." Indeed, the number of booking requests for condos and suites in Hawaii that can accommodate family groups has risen substantially, Phillips said. "We see more grandparents, parents and kids traveling together," he said. "We also see more hotels such as ResortQuest Hawaii and Outrigger building to these markets and properties such as Hyatt and Marriott introducing more kid-friendly games and facilities." When it comes to Hawaii's travel market, perhaps it's a small world after all. Properties that offer kids' programs usually will go out of their way to cater to this market. » When choosing a property, look at the marketing. Ads that include pictures of kids playing on the beach or show family scenes demonstrate that a property is going after the multigenerational market. » Properties that offer family-style suites are guaranteed connecting rooms and are likely to be more comfortable for multigenerational travelers. » Look for properties that offer family pricing such as kids eat, stay or play free or offer all-inclusive vacations. » Choose destinations (like Hawaii) that offer a good mix of indoor and outdoor activities for both kids and parents --this makes for a more enjoyable vacation. Nearly 60 percent of family travelers use children's services. » Special kids meals are used by 41 percent and are the most popular perk category, followed by hotel discounts (used by 30 percent), video and other games (used by 22 percent), supervised activities (used by 13 percent) and baby-sitting (used by 6 percent). » Among travelers taking children along, those aged 35 to 44 had the highest use of children's services (71 percent), while travelers aged 65-plus had the lowest use (28 percent). Travelers with family incomes of $50,000-plus have the highest use (67 percent), while travelers with family incomes of less than $20,000 have the lowest use (30 percent).